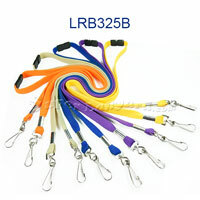 Double hooks lanyards with a swivel hook on each end of strap that is great to keep larger size badge holders. Most big game will give a ticket with game schedule plan. The badge holder must has bigger space room for the game ticket. So double clips lanyard is a great id strap to keep the larger badge holder. We also offer FREE shipping !! on orders of $150 or more when you purchase items from this category. Superlanyard.com is your source for quality lanyards, custom lanyard cords, badge reels, badge holders of all sizes and shapes. Whether you need id badge holders for office, exhibition, tradeshow, office, school or promotional events, we have what you are looking for. Most of our id badge holders can be custom screen printing with your logo, brand, company name, event name or a slogan. A quality badge holder displaying your logo will create a impress images.